Mother’s day just ended so you’re probably wondering if this article is late. Actually it isn’t. It’s right on time- for next year. 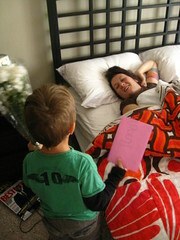 Did you rush at the last second to get your mom a present, make an acknowledgment or plan a visit? Did you feel stressed? Did you do your best? Probably not. Do you go through the same unfortunate process for birthdays, anniversarys and other events? It’s time to put your best foot forward. Think now. Think about what you did that worked and what you did that didn’t work. Think about what you should have done. Jot down a few notes about your thoughts. It doesn’t need to be a set of ideas or anything concrete but it needs to be coherent enough that it will jog your memory about your thoughts next time you read it. Review Monthly. Set a reminder for each month during your monthly review (someday/maybe) to look over your notes. Each month take a couple of seconds to expand and organize your ideas. Some months you’ll have nothing new to add. Other months you’ll gain a clear focus on what you want to do. Start Preparation. Two months before the event, finalize what you’re going to do based on your notes and set actions for yourself to do it with plenty of time to spare. Post Event Review. After the next Mother’s Day (or birthday etc) review how it went and start preparing for next year. Speaking of preparation: Mom, Happy Mother’s Day- I’m a year early.